Pulses such as haricot beans are good for the health of the gut. They contain complex carbohydrates called oligosaccharides and resistant starch that are broken down by bacteria in the gut to produce nutrients which help to keep the gut wall and other systems in the body healthy. They also contain protein and dietary fibre which help you to feel fuller for longer. Pour a little olive oil into a large non-stick frying pan and heat gently. Add the chicken breasts and cook each side for five minutes on a medium heat until golden brown. Check the chicken is cooked by piercing the flesh with a skewer. The juices should run clear with no sign of blood and the skin should be golden. Remove the chicken from the pan and cover with foil until you are ready to assemble the dish. While the chicken is cooking, boil/steam green beans for five minutes until tender. Place the haricot beans into a bowl with the tomatoes, cooked green beans, salad onion and torn basil leaves. Add the extra virgin olive oil, a squeeze of lemon and season to taste. 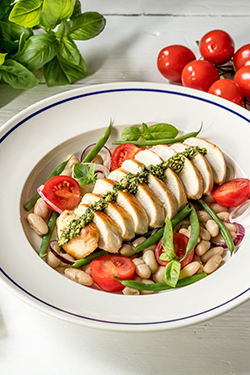 Slice the chicken breast and place on the beans and drizzle with the pesto dressing. To make a low FODMAP pesto. Take the leaves from a small bunch of basil, 2 tbsp finely grated Parmesan cheese, 1 tbsp pine nuts, 5 tbsp olive oil and 1 tbsp garlic oil and blitz in a liquidiser or food processor. Season to taste. If you are following the Low FODMAP diet you may wish to either reduce the beans in this dish by half or replace them with thinly sliced boiled, new potatoes. You could also use the green ends of salad onions and garlic oil, which are both low in FODMAPs to flavour the dish.